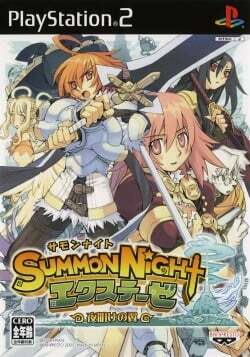 Game description: Summon Night Ex-These is a spin-off of the Summon Night series. It was the series first attempt at an action RPG. The player takes control of Leonus & Ainna, two adventurers that wake up in a cave to find out that not only they lost their memories but are also sharing the same body. They go on a journey to look for the mysterious Nova, who might know something about their past. The character you choose at the start becomes the lead in the story and the true owner or the body, the other one still participates in the plot as a sub-protagonist. Normally, they are not able to talk with each others, but using the “Stone of the Everlasting Night” they can met inside an artificial world.